I could have stayed in bed and continued dreaming, however for Day 15 of Thirty Days 2008 I headed to Rocky Mountain National Park and the Bear Lake area. 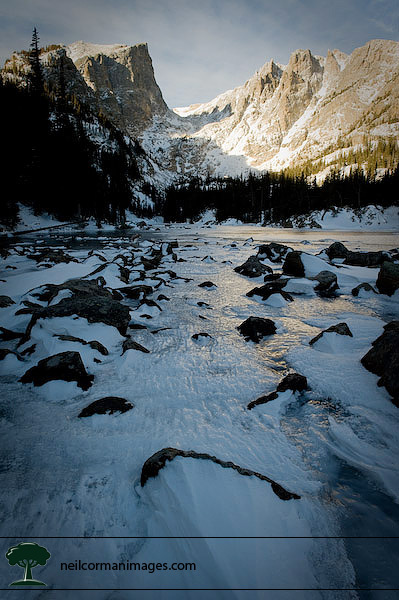 After photographing around Bear Lake at sunrise I hike a little over a mile to Dream Lake. As usual there was a stuff wind, and once I got to Dream Lake it just started to howl. I didn’t spend much time around the lake, as this was also a scouting mission for future trips towards Dream Lake later this winter. On this scouting trip I realized towards the end of the hike I probably should have had some snowshoes with me, but it wasn’t too bad. Also with my many layers I was good and know what is needed along the hike. Stop by tomorrow for Day 16 of Thirty Days 2008. This morning at 6:45 AM the National Weather Service declared the first snow in Denver and with a small amount of measurable snow we will not have the latest snowfall ever this year. The latest first snowfall in Denver occurred on November 21, 1934 and the average date of first snowfall is October 19th so it was a little later than expected. With the forecast for the next few days, if we did not get the snow today it would have been possible to break the record. As it was warm yesterday the snow is not really sticking to the streets, but on other surfaces it is a different story. 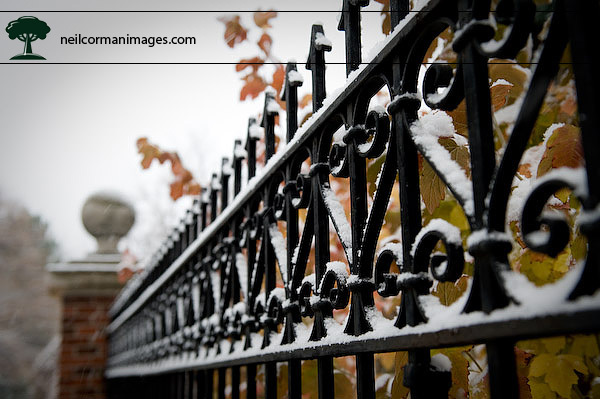 I headed down the street towards the Governors Residence and took the following image, of the snow on the fence as well as some of the remaining leaves. Stop by tomorrow for Day 15 of Thirty Days 2008, and of course the snow will be long gone by then as the temperature warms back up for the weekend. 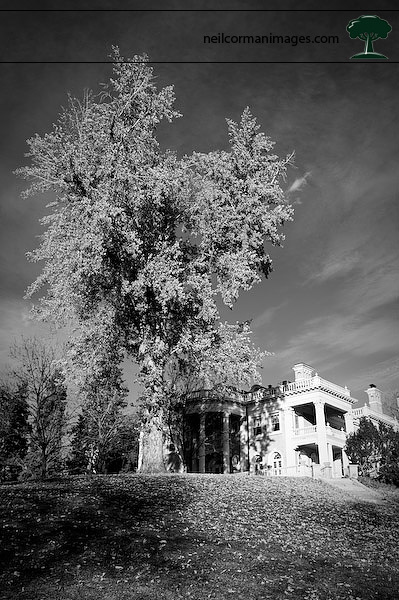 Day 13 of Thirty Days 2008 brings us the Grant Humphreys Mansion located near Governors Park. I guess it is appropriate for day 13, as I found out after the fact the mansion is haunted. When taking the image I was thinking color all the way with the nice blue of the sky, green of the grass as well as some leaves in the tree; however with the nice contrast a change to black and white worked even better for this result. Stop on back tomorrow for Day 14 of Thirty Days 2008 and maybe even something in color. Denver is known as the Mile High City. When I have talked to people flying into Denver for the first time they expect mountains all around being a mile high, however it is just situated at base of the Rocky Mountains. In the city itself there is a reminder of the altitude from the row of purple seats at Coors Field marking a mile high to the lack of oxygen visitors find when first arriving in Denver front locations at sea level. 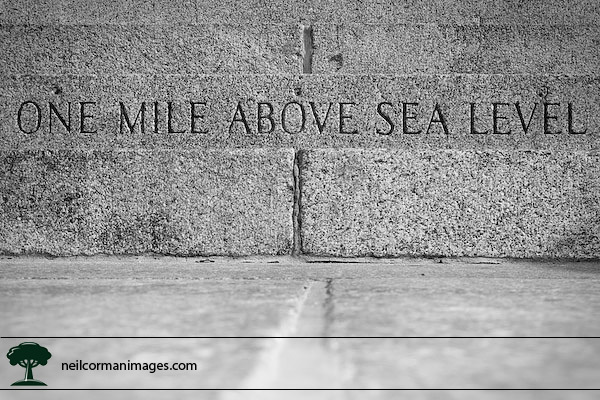 However one particular marking is at the State Capitol where engraved on a step leading to the west entrance and looking towards Civic Center Park is the indicator of “One Mile Above Sea Level” which is the image for today. Be sure to stop by tomorrow for Day 13 of Thirty Days 2008. 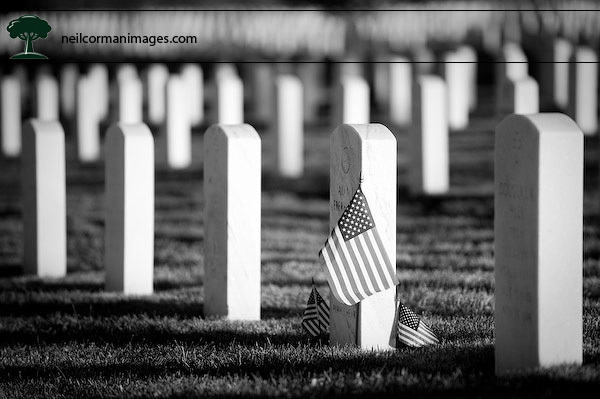 Today in the United States is Veteran’s Day which led me to Fort Logan National Cemetery this afternoon for some images. As there were quite a few people out today, I ventured to areas which did not have people at the time in order to respect their privacy at the cemetery. Last year for Thirty Days 2007, I also went to this cemetery however it was in the morning right after sunrise. I noticed many flowers throughout the grounds, but the flags in the below image attracted my attention and after looking at the image in Lightroom decided converting it to black and white was more powerful than just in color. Be sure to stop by tomorrow for Day 12 of Thirty Days 2008. 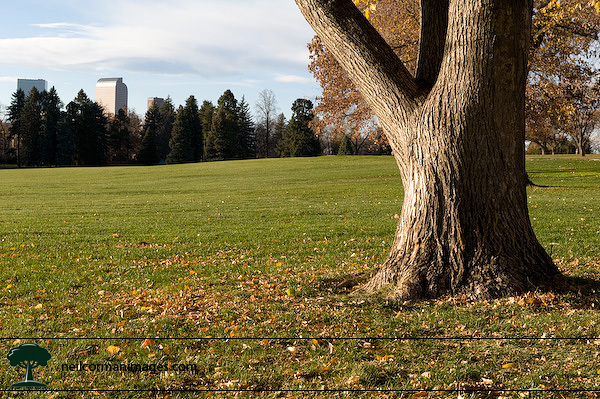 This afternoon I headed towards Cheesman Park once again to try to grab an image of the pavilion which I thought would show the cold chill in the air. After photographing around there for a while I looked south in the park and noticed the traffic along 8th and knew the shot I wanted to grab. Once I got near the street I adjusted my original idea and sat down on the slight hill between the street and one of the jogging trails within the park. Adjusting my exposure so it could be slow enough to grab some motion but not too slow to cause camera shake I framed my image and waited for cars to pass by along the street during rush hour. I tried some vertical and horizontal images and out of the corner of my eye noticed a smaller bus heading towards my location. The challenge for today was getting the shutter speed just right depending on the speed of the cars. 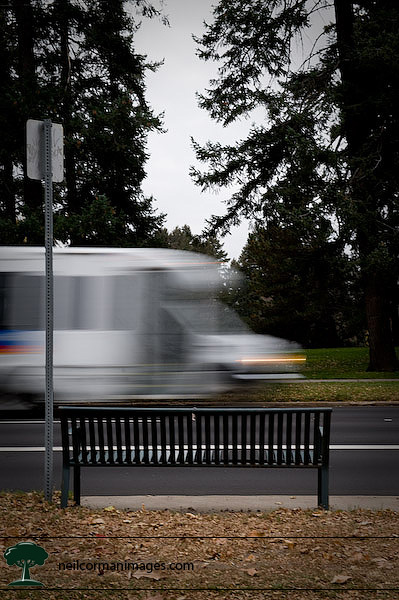 Just to the right of the bench is a stoplight to control the traffic speed as it does flow quite nicely, but this meant cars would be at various speeds depending on the control device. If the car was going too quickly it just became too much of a blur, and likewise if the shutter speed was too short a car not moving quickly would be frozen and not have the slight blur of the motion. With Day 10 now posted we are 1/3 of the way done for the month, but there is plenty more to go in Thirty Days 2008 so you will want to stop by tomorrow for Day 11. I was thinking of what could be a good shot prior to some weather change in the forecast overnight, and my initial location I was thinking of for today has changed quite a bit since I was there last. So as I was in the Golden area, I ventured near where I use to work. As the sun had gone behind overcast skies with the front moving in I was thinking of some options which would be good without direct sunlight. 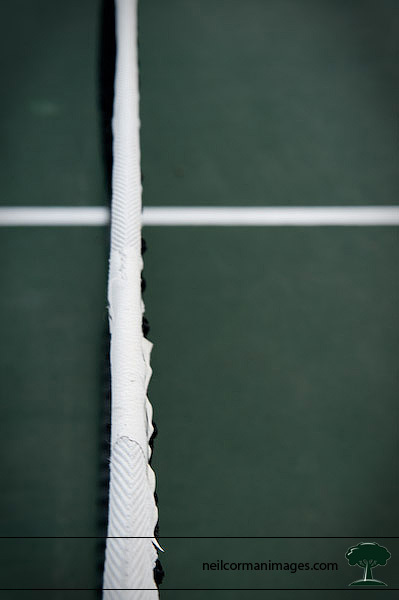 Seeing the tennis court vacant at Tanglewood Park I tried some different compositions and the lines in the image for today is what was the most interesting to me. As some groups were starting to show up in the parking lot to use the tennis courts I only got off a few images above the net, but even with the limited time it still worked out well for today. Be sure to stop by tomorrow for Day 10 of Thirty Days 2008. One of the most difficult things to do as a photographer is recreate an image exactly how you did it before. While you may get close to recreating the scene, there will usually be something off making it once again different than the original image. This is what happened today on Day 8 of Thirty Days 2008 as I headed to Washington Park here in Denver. You may recall on May 1st I took an image at the location of a tree and the steam coming off the northern lake in the park. After talking to some people last evening at the gallery opening about the Snowy May Day image, I decided to go back today to try to recapture the image and compare the look a little over six months later. The one thing I did not have with me was the original image, but I knew it well in my head after looking at it during the opening last night as well on other promotional pieces around my office. I recalled the location I was in when taking the image and the key fact that the lightpost was suppose to be between the tree branches. What I needed though was a second reference point and without having that known reference point I was taking a guess. Looking at the image I took below, I see that I needed to be about two steps to the left to match the original and maybe some more of the tree branches above but it is close. Overall I think the original image is much stronger mostly because there is something going on that day, with fresh snow. Today it was a little blah in the skies and I took advantage of that to underexpose the foreground a bit to get a darker look on the tree as well as getting a feeling in the sky. Be sure to stop by tomorrow for Day 9 of Thirty Days 2008. 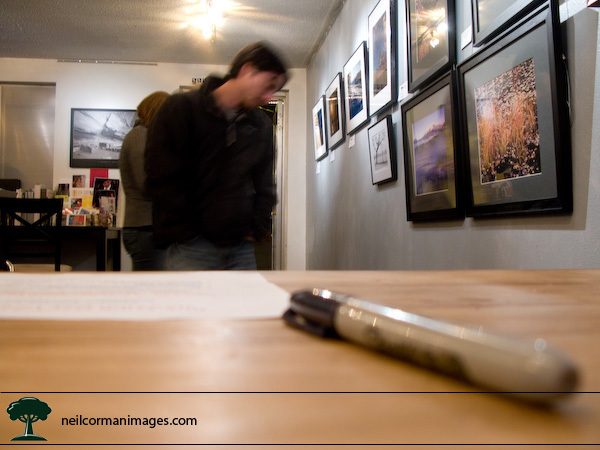 Today I particpated in a shared gallery show at Bentwave Gallery and Studio in the Tennyson District of Denver. Even though the cooler months are here there was still a good turnout. The photographs with the white matting in the below image were some of mine on display this evening. Be sure to stop back tomorrow for Day 8 of Thirty Days 2008. 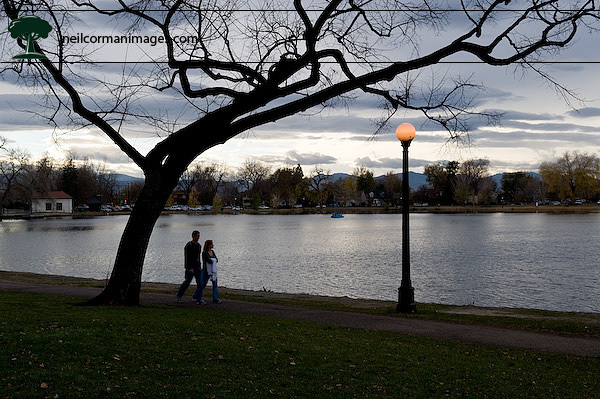 It was a nice blue sky day here in the Denver area on day 6 of Thirty Days 2008, and even though it was cool with the bright sun beating down it made it easy to walk over to Cheesman Park this afternoon for some late afternoon light. My initial thought on heading over there was to use the pavilion as the image for today, as I was not sure what the trees and grass would be looking like with the change of seasons here. For the most part the leaves have all blown off the trees, which didn’t surprise me with the winds the past couple of days. Seeing the nice green lawn, I wanted to use that as part of the image and after getting low to shoot the pavilion I decided to head towards the southeast corner to see how the large lawn would look like with a couple of buildings from downtown in the background. After trying my original thought I noticed one tree which still had some leaves and headed in that direction, and quite instantly came up with the following composition. Be sure to stop by tomorrow for Day 7 of Thirty Days 2008.